Going camping together is one of the most enjoyable activities for kids during the warmer months. This is a great exciting outdoor activity for the whole family, not to mention a fun bonding experience! Camping activities are simply fun and a great way to spend some quality time with your kids. You can even camp the night out in your backyard and spend some memorable time together. But before fixing up that tent in your backyard, why not plans some fun camping activities for your kids so as to make the best of the special time together. Camping wouldn’t be fun if there was no food. And kids love to eat. So, why not let them help to dish up some snacks for the camping. The whole family can sit together and make some snacks. Try some simple to make snacks with bread, fruits and nuts. Tell the kids to mix up the ingredients. Apples and peanut butter are always a favorite and easy to handle. Get some nice cook drinks ready for kids. Of course, no camping trip is complete without smores! Sure, they’re a little messy, but they make a great treat! Set up an obstacle course. In the backyard and let the kids leap over or crawl under those obstacle. Tell them to crawl under the patio table or jump over the garden hose. You can also organize races and give a small prize to the winners. 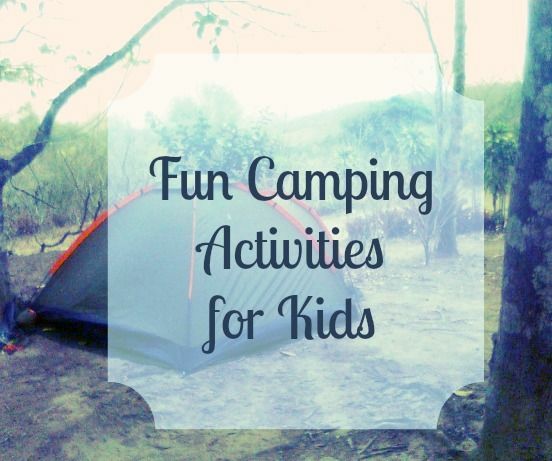 These camping activities for kids are great because they help give your children a bit of exercise and tire them out for bedtime. Get some music on and let every member dance together. This is a great way to gel together and feel comfortable with each other. You can even play some game together while dancing. Another of those favorite camping activities for kids is to listen to stories. Get some story books and tell them a nice story. Better yet, let each one of them tell a story that they make up! Avoid telling ghost stories as it might not be the best of the idea for the younger kids. Try to get them involved in some funny family stories. Enjoy a late-night campfire simply conversing, playing games around the fire and munching snacks. Some games can be played around the campfire and one good example is “I Remember” –. You’ll have a lot of laughs and some great moments around the camp fire. Camping is certainly one of the one of the best activities that a family can plan together. This is the best way to share time together, bond over some great food, stories and games. During these fast paced times, make the most of the little pleasures life offers us and camping with your kids is one of them. Great ideas! I like the jump and crawl – sounds fun!! I’m not big on camping (eww bugs!) but I would really like to take my kids camping at least once in life. These were all great suggestions. Thanks for sharing! My son was never into camping or much for anything outdoors. But, these are great tips. Love to go Girl Scout camping–thanks for the ideas! I have got be shown a couple of good goods in this article. Undoubtedly truly worth book-marking to get returning to. I wonder what sort of ton effort you set to create these kinds of superb educational web site.